Rennick Williams hucks a rock in lower Tea Cup Bowl on a stellar powder day Saturday in Vail (David O. Williams photo). Spring is coming in reluctantly in the Vail Valley, where Vail and Beaver Creek both saw solid powder days last weekend and more snow is in the forecast this week — heading into the always-popular Easter weekend. Conditions were as good as they’ve been all season on Saturday, with 10 inches new at Vail and a foot at Beaver Creek under sunny Colorado skies. 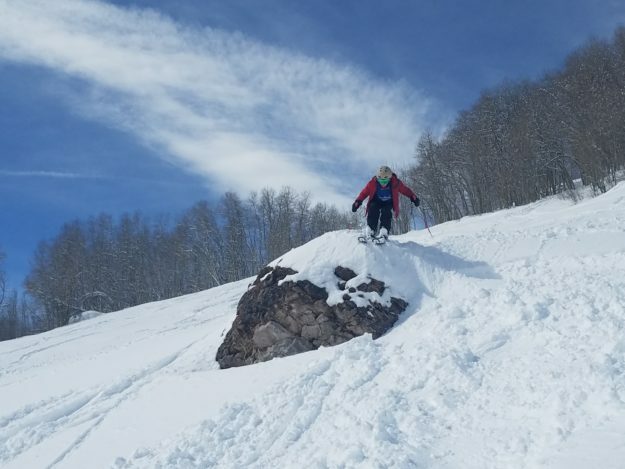 Both ski mountains are pretty much 100 open for spring breakers and anyone looking for some final powder turns during the last three weeks of the ski season. Easter falls on Sunday, April 1, and then both Vail and Beaver Creek are set to close for the season on Sunday, April 15. It looks like the below-average 2017-18 ski season could finish with a bang as forecasters call for several storms over the next week or so. “The first storm of the week will bring snow to areas near and east of the divide on Monday night into Tuesday morning, and then the second storm should hit the northern mountains on Wednesday night with snow continuing into Thursday morning,” Opensnow.com meteorologist Joel Gratz wrote on Monday. Big crowds came out over the weekend, with cars parked along the frontage roads in Vail. Pink Vail once again raised huge amounts of cash for the Shaw Regional Cancer Center in Edwards, and there was also lively and enthusiastic participation in the local March For Our Lives anti-gun-violence protests. Kudos to all who came out for both events. If you got out early on the slopes Saturday, you enjoyed some soft, still-cold freshies before the intense sun set things up by early afternoon. Even then, soft snow remained in the north-facing trees throughout the day. That’s the key during the spring months. Catch fresh snow early because once the sun comes out, things bake quickly. Conditions will likely be good both Tuesday and Thursday in the Vail Valley, with another possible storm moving in late on Easter Sunday, April 1. VAIL, Colo. – March 26, 2018 – Vail Mountain will host its annual interdenominational sunrise service on Easter Sunday, April 1, 2018 at 6 a.m. inside at Eagle’s Nest. The Eagle Bahn Gondola will open to the public at 5:30 a.m. to transport guests from Lionshead. Complimentary baked goods and beverages will be provided. In addition, there will be two afternoon Easter services outside at Eagle’s Nest: scheduled for 12:30 p.m. and 2:30 p.m. at Simonton Deck also known as the Holy Cross observation deck. For those planning to attend the Easter sunrise service, the Town of Vail is offering free parking for vehicles that enter the Lionshead parking structure after 5 a.m. and depart prior to 10 a.m. Upon departure, attendees should inform the booth attendants they were at the service.